Can you believe it? I can't! My youngest mini man is two! I thought I'd share his birthday outfit today for Funky Kid. 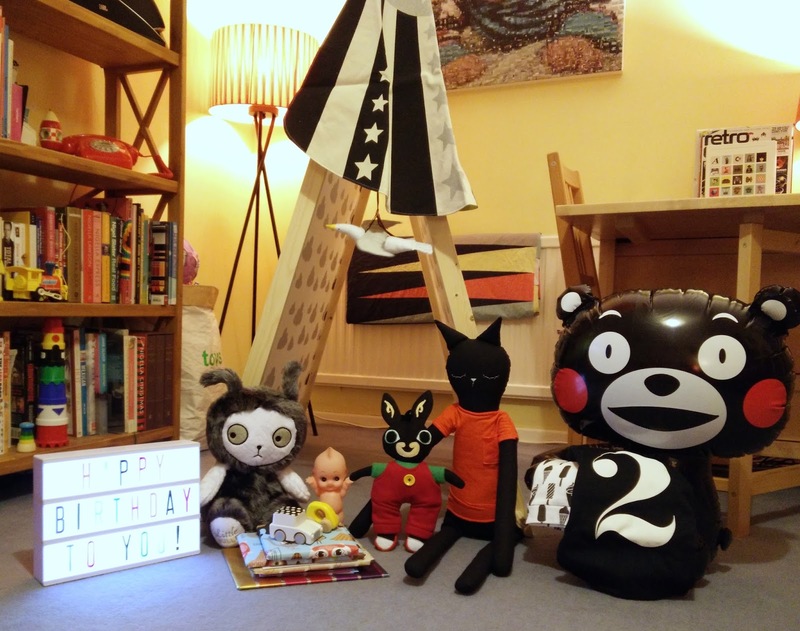 Felix was very lucky this year, his birthday is the 25th of May and this year that fell on the bank holiday which meant we could all be together. We planned to take him to the Aquarium in Bristol because he loves looking and fish, well, any creatures really! It was quite cold on Monday and I must admit I felt a bit bad because the boys were both wearing shorts.. mind you, I wore a knee length dress and I think I was colder than them. For one thing, kids don't seem to feel the cold much. Secondly, they could take it in turns sitting in the buggy with a blanket around them! I bought Felix a fantastic number print t shirt from Nor_Folk earlier in the year, with a 2 on, obviously! I saved it so he could wear it for his birthday and teamed it with some beautiful monochrome print shorts from one of my fave handmade stores, Marmalade Sky Baby. These shots have ice creams/lollies on them and they are adorable! 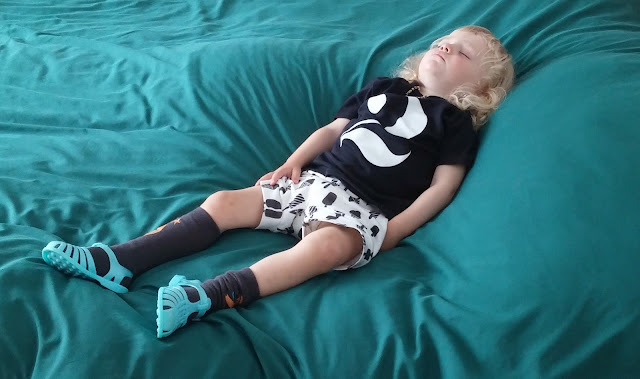 To complete his outfit Felix wore his new Bebe De Pino socks with well, what looks to me like a snotty nosed crescent moon!!! 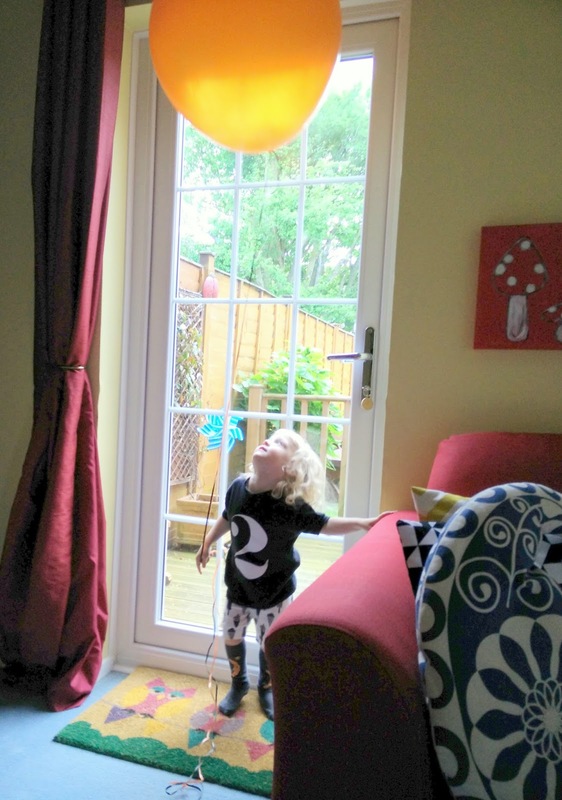 Perfect for Felix who loves the moon and often has a snotty nose! I think he looked pretty damn awesome but I have to say Ethan was rocking it to in a classic cloud print tee from Whistle & Flute, a milk lolly print sun-visor from Bebe De Pino (via MoMoXKoKo), banana prints harems from Bows & Candy, socks from Hubble & Duke and day glow jellies from SunJellys. He looked a bit like he was off to a Skins rave or something... but he liked it! The boys had a great day, the aquarium was an (expensive) success, there was more to look at than we'd anticipated. Pete and I had a scrummy falafel from The Falafel King (serious yum!) for lunch. We popped by the Grandparents house for cake - I made Felix an Elmer cake which went down well. All in all, it was a lovely family day. I just can't believe it's been two years since I pushed that cheeky man out in the corner of our living room!! Have you written up a kids fashion post? Enjoyed having the kids home from school and wearing some funky clothes? Link up below! When I was a teenager, one thing I always wanted to do was to go to Glastobury festival. Every year it got close to Glasto time I would start to feel a bit sad. A sense of loss would pervade me. Yet again I hadn't made it. Of course, in my early teens that was unlikely anyway.. but I always thought I would make it there in my late teens or twenties. It didn't happen. I finished at school, I didn't go to Uni, my friends moved to different parts of the country. Glasto was pricey, I wasn't earning much money.. it just didn't happen. Pete wasn't overly bothered about going to a festival. Fast forward to 2009, I was heavily pregnant with Ethan and Pete got the chance to work at Glastonbury as part of the police web/media team. He didn't stay overnight (I was due any day) but drove there every day. Despite the fact he was working he did get to experience Glasto and soak up the festival vibes. He ended up working there again in 2011. Have I made it there yet? No. My desires and wants have changed in life. I am now in my *cough* early thirties and I have two children. These days I'm just not to fussed about the idea of going to Glasto. Pete tells me it's huge. I don't want to go to some massive over priced festival. I like the idea of going somewhere small. For me, it'd be more about live music, a chilled out feel and the chance to be with my family. I started looking into smaller UK festivals. There are quite a few out there that pride themselves on staying small, intimate and family friendly. That's just what we want! One that jumped out at me was Farm Fest. First of all, it's not far from us. Secondly, we know lots of people who have gone and loved it. Thirdly, it is very family focused. 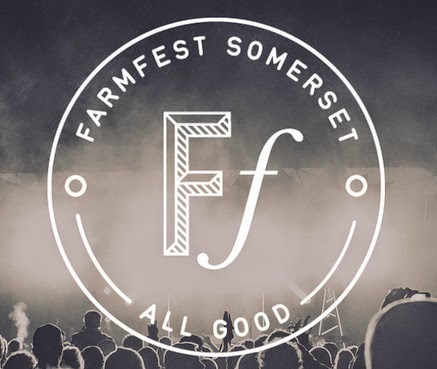 The Farm Fest team have been very kind and offered to let us attend their festival so we can help spread the word. I will be going with Pete and the boys and will be posting pics on Instagram and tweeting whilst we are there. After the even I'll be posting a detailed review on here with lots of pics. In the meantime though, it's all about the prep! We are essentially, as a family, Festival Virgins. Can you help us? What do we really need? What can we leave behind? Our first thought was a tent so we bid on one on eBay and went to pick it up last week. That's that sorted. Ethan already has a "ready bed" so he's sorted but we need to get one for Felix and one for ourselves. Do you think we should get a ready bed? Or just separate sleeping bags and a bed roll? I'm thinking it will be advisable to take a lot of loo roll, antibac lotion, wet wipes, sun cream, hats, sunnies, wellies, rain gear. We have bought a special charger. You charge it up from mains power and then you can use it to recharge your phone, camera etc. So we shouldn't have any issues using our phones whilst away. Shall we take gin in a plastic bottle? Only old clothes I'm thinking... Lots of snacks for the kids! I could really do with your advice so get commenting below or tweet me!! And if you fancy coming yourself, go grab a ticket! 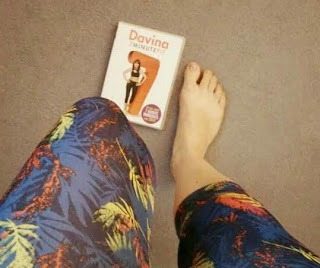 Davina's fitness DVDs are things of legend, aren't they! Everyone knows Davina, she's one of the most friendly TV hosts out there. Her fitness DVDs seem to be hit after hit and I've always wondered why. I'll be honest with you. I've been put off trying one of her DVDs because she looks sooooo amazing I thought it'd wind me up no end seeing her prancing around on my TV looking all amazing, not sweating and finding it all easy.. So, when I was was offered the chance to try out her most recent fitness DVD recently, 7 Minute Fit, I paused.. but then I thought, what the heck, why not? Well, I am so glad I did. I was very pleasantly surprised but this DVD. 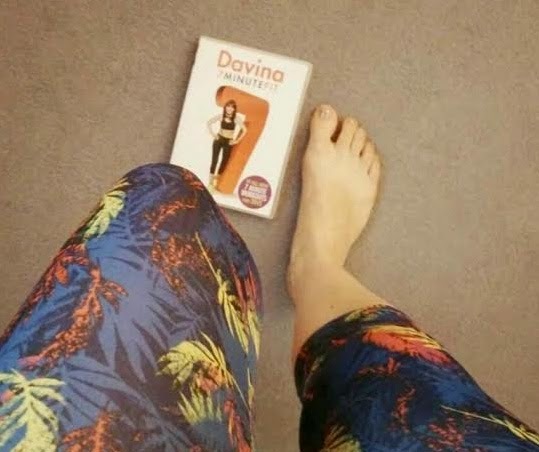 First of all, Davina remains her friendly self. She is so likeable, so watchable. Yes, she looks amazing, but she really does sweat and works hard in it! The work outs themselves are fab. What I love about this DVD is that it's really simple to do, and easy to fit around your life. There is a warm up which lasts just a few minutes (and it is effective) and a cool down and then several different work outs which last 7 minutes each. So, you can do a warm up and one work out, or the warm up and every work out. It's up to you. Great to tailor around life. Some days you are less tired or have more time. Some days you are tired out but want a quick burst of fitness. The exercises are varied. You can work on an overall fat burner, you can concentrate on your tummy or legs. You can even test your fitness levels. A good way to see how you've improved. When I'm doing the DVD I start with the warm up. I then pick two or three of the 7 min work outs, I try to get a variety, so I might pick boxersize to get the whole body working, and then the intense tummy work out. I always finish with the cool down because it's relaxing if nothing else! There is a very useful (and recommended) section on how to do various different exercises and stretches which is handy if you are new to exercise or aren't familiar with certain ones. Overall, this is a really great home work out. The variety, speed of exercise and the friendliness of Davina and her trainer make it enjoyable. And I do mean that! 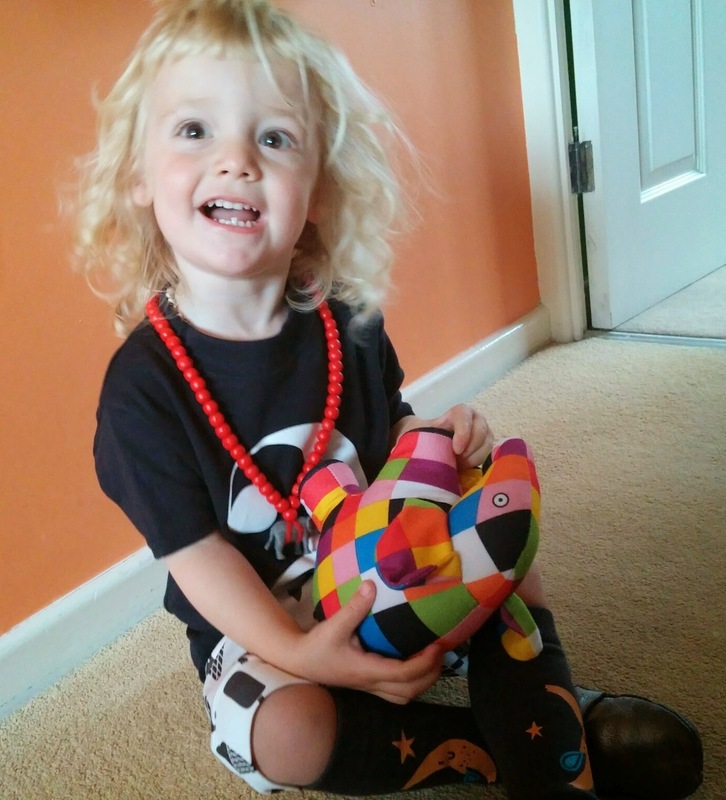 If you read my blog the chances are that you've twigged that my boys have a lot of clothes. 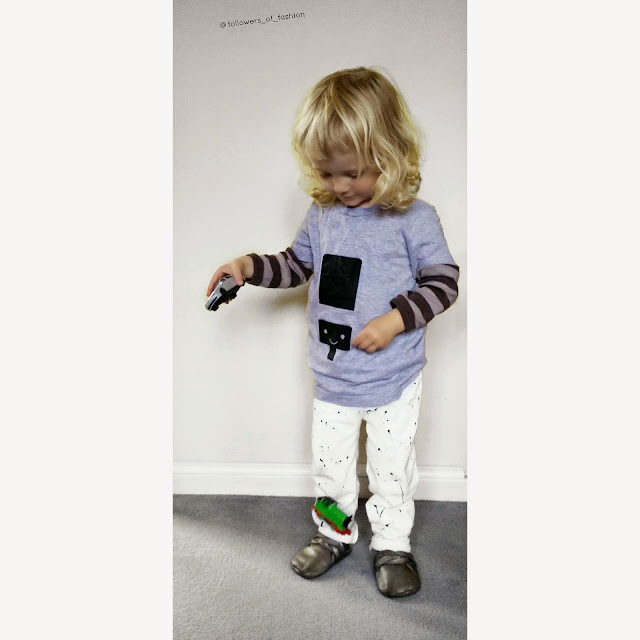 When Ethan grows out of clothes I generally save them for Felix to grow into (always nice to see something worn again!) but when Felix grows out of clothes I have to make a hard decision. Do I hold onto them as a keepsake or, as I like to tell myself, future grandchildren (yes, I do fold items up, sniff them, kiss them and say "see you again on the Grandkids - I hope!"). I try to be hard and either pass on, giveaway or sell on most of his clothes though. Like many people I use eBay to sell on a lot of old clothing but there are some more special, nicer or rarer items that I try selling in other ways. 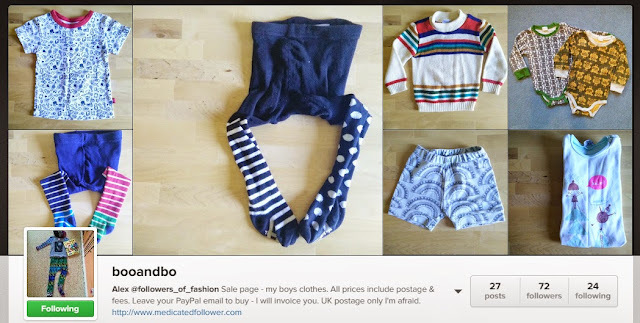 I'm currently uploading quite a bit on a second Instagram account I have, @booandbo which I created just as a platform for selling on old clothes. It hasn't been wildly successful though so I thought I'd mention it on here. You can check it out here or click on the tab above (under my image header there's a tab called "Buy Our Clothes On Instagram"). Prices are quite low and include UK postage. All you do is comment with your paypal address (or you can comment with 'me please' and DM me your paypal address). Once I have your paypal address I'll invoice you. Easy! We're a bit obessed with lights in our house. One of Ethan's first words was "light". He loves lights. Almost everything he draws includes a detailed amount of street lighting. 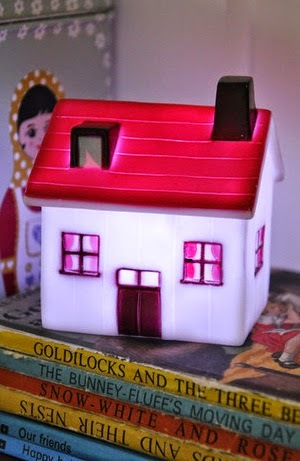 If he draws a house, every room has lights in it. He has always paid attention to detail. He loves a good light! We can't be the only ones who love lights? How about your family? It's a pleasure and an honor of mine as a blogger to be sent children's books for review purposes. I can't get enough of reading to my boys and they love a new book. I especially love finding new (to me) authors and supporting smaller publishers. I disovered Tiny Owl Books on Instagram of all places. Tiny Owl are a husband and wife team, Karim Arghandehpour and Delaram Ghanimifard. They live in London currently but wanted to creating a publishing house that would reflect the culture of their home country, Iran and a variety of cultures from around the world. 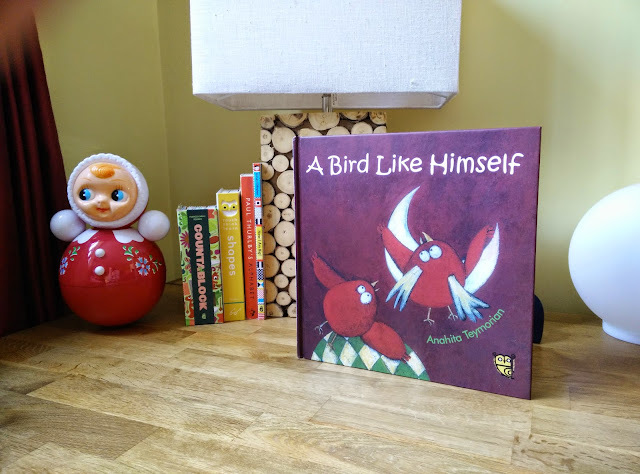 We were sent a copy of A Bird Like Himself by Anahita Teymorian an Iranian autor/illustrator. Anahita's story is all about parental love and growing up. 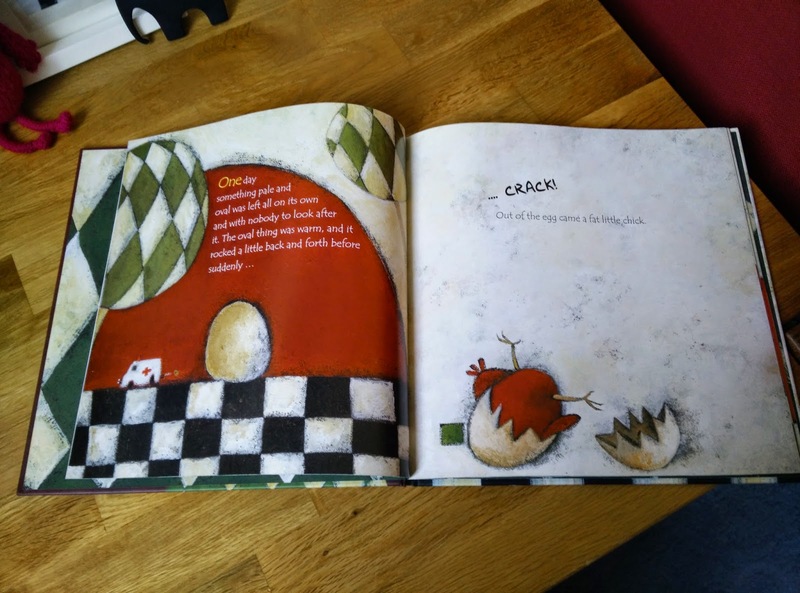 The basic story is that one day a large egg is left in a forest. A chick hatches out but there is no mother there to look after him. Instead, he is found by a mixed group of animals who all try their best to bring the chick up in different ways. All of the animals love the chick but the one thing they are unable to teach him is how to fly. I don't want to spoil the story and give it all away but it is an adorable tale. 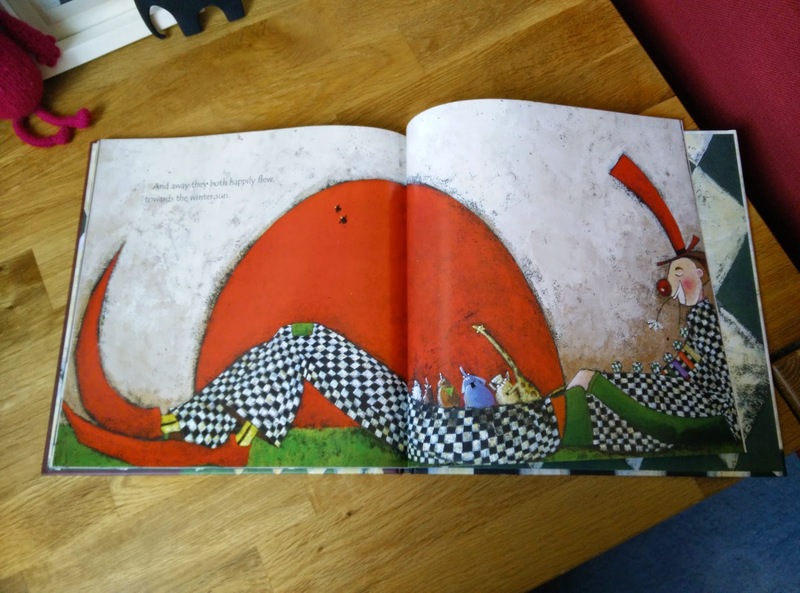 The illustrations are beautiful, striking and quite different. The colours are bold but there is also a good use of black and white making them very eye-catching for even young children. My boys enjoy the story itself. Anything that reaffirms love for a "child" is a good thing. I like how the story shows how the chick grows though. Love and support mean that he is, eventually, able to spread his wings! All in all, a great little read. 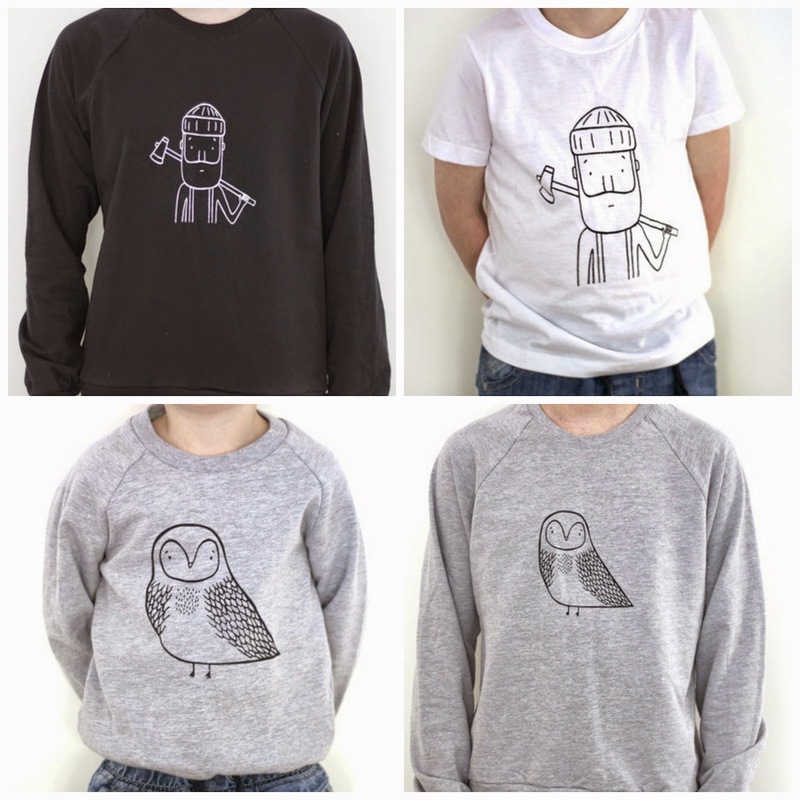 I love the ethos behind Tiny Owl and hope they go from strength to strength! I like to get a bit crafty when I can, but because time (and resources) are limited, it has to be something that is quick, easy and effective! I've always thought that paint splatter looks quite cool and I thought it'd be easy to replicate and quite good fun!! I am really into monochrome at the moment (as if you hadn't noticed!!) so I bought a big pack of white socks, a pair of white leggings and a pack of white vests. 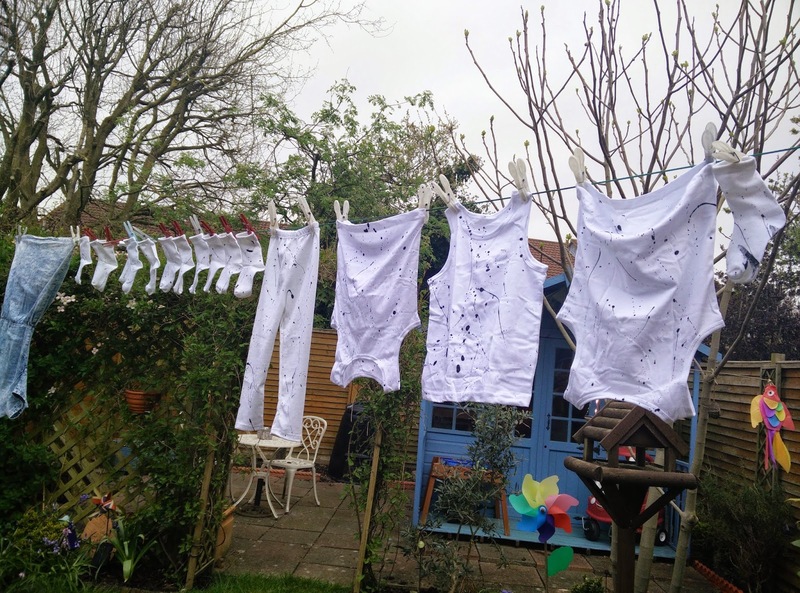 About two weeks ago I hung them all on my washing line and then I grabbed a paint brush and some black Dylon fabric paint (which I already had) and I simply went outside, loaded up the paint brush and repeatedly splattered both sides of the clothing! Hanging the clothes on the washing line was a great idea because it meant I could access both sides of the fabric at the same time (if I'd laid them on the floor I wouldn't have been able to turn them over until the first side was dry). It also meant they could air dry easily. What wasn't so sensible was that I didn't think about what I was wearing. I wore my denim dress and quite quickly I ended up with some paint splatters on it!! At that point I took the dress off, put a black top & leggings on, hung the dress on the line with the other clothes and resumed splatting!! All in all it took me about half an hour. Once the paint had dried I brought them inside and ironed them to set the paint. That was it!! I think they look amazing. Even my own dress, it looks cool! 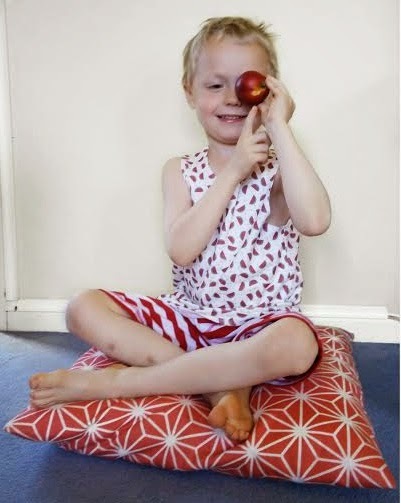 Have you heard of the children's clothing shop Gorgeous Little George? They have launched their own range of t shirts recently and I'm really loving them. 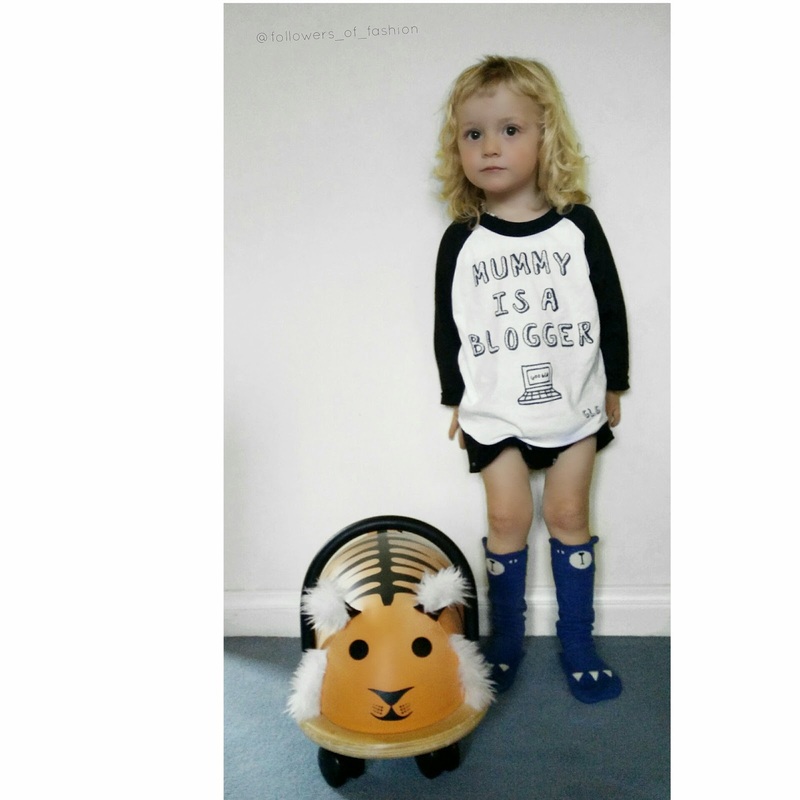 I bought one for Felix that says "Mummy is a Blogger" and it's getting some real love on Instagram!! 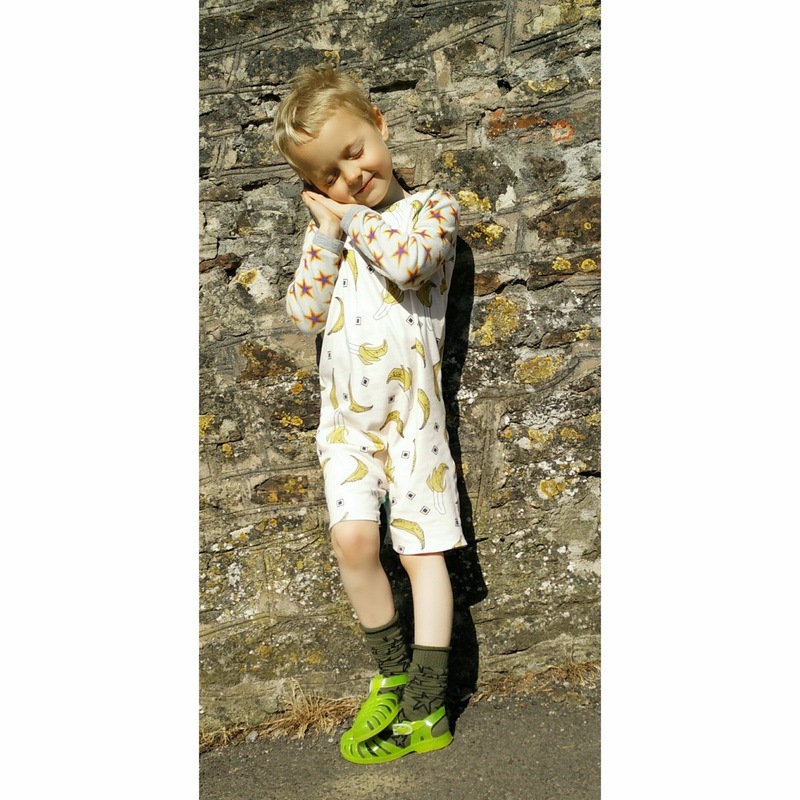 If you've written any kids fashion posts lately, link up below! Don't forget to check out the giveaway I'm running here for a beautiful Elodie Details hooded towel. On Insta I'm giving away a fantastic bedding set! Elodie Details are a brand I first discovered when I had Ethan nearly 6 years ago now. 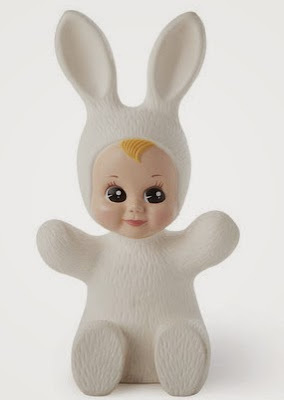 I first loved them because they made beautiful baby bottles and accessories. Over the years their range has grown and grown as has their following. 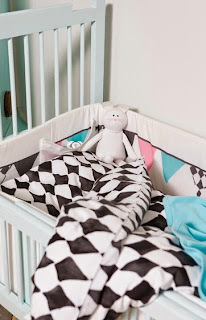 Now they make beautiful home wears and even their own strollers as well as the most stunning stroller/buggy accessories, blankets and clothing. The lovely folks at ED have offered my readers the chance to win two prizes. I'm going to be giving one away via my blog and one on Instagram. Two wonderful prizes! On Instagram we're giving away a Graphic Grace cot bed bedding set and here on the blog we're giving away a Graphic Grace hooded towel. They are both heavenly, bang on the monochrome trend and unisex. Perfect really! If you'd like to be in with a chance of winning the towel simply use the Rafflecopter below and like both my facebook page and the Elodie Details facebook page. Don't forget that I will be checking that the entries have been made correctly (i.e. if you click to say that you've liked the Elodie Details facebook page that will be checked up on). It's only to keep things fair. If you're on IG, don't forget to check out the giveaway there! Both giveaways will end on Tuesday the 19th of May and the winners announced shortly after. Good Luck! Ahhh, it's that time again. The time when I can try to ease my craving to shop by enabling everyone else instead! There are so many wonderful indipendant brands out there now across the world that I think this feature could roll on forever but today I'm very happy to introduce to you Lovelane Designs. Of course, you might have heard of them before.. but as they are in the US you might not. I can't remember exactly how or when I stumbled across Lovelane. It might even have been a random finding on Etsy, but I know it was over 6 months ago and I've been lusting after their beautiful designs ever since. 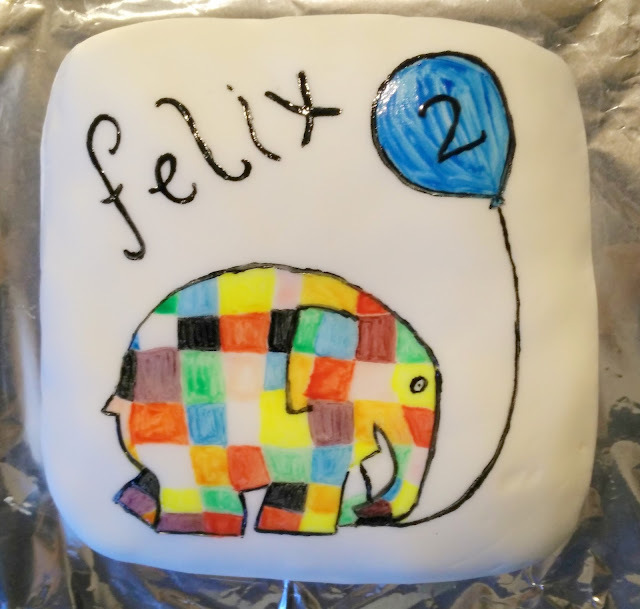 As Felix's second birthday approaches (yes, I know, how?!) 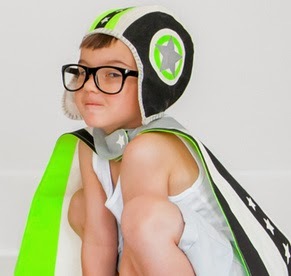 I started to think about what to get him and it seemed to me to be the perfect time to order one of Lovelane's wonderful superhero capes! Kids love dressing up and I love kids dressing up but I'm not really a big fan of branded tacky costumes. 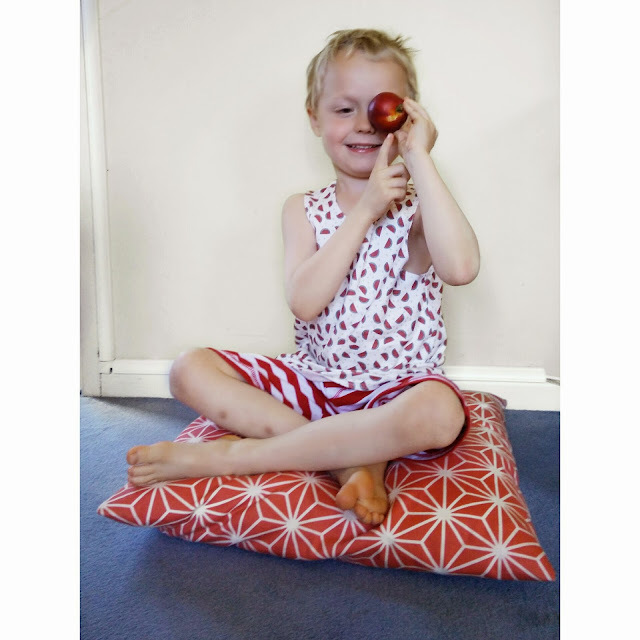 There's a time and a place, of course, but I prefer handmade and tasteful where possible! This is where Lovelane comes in. 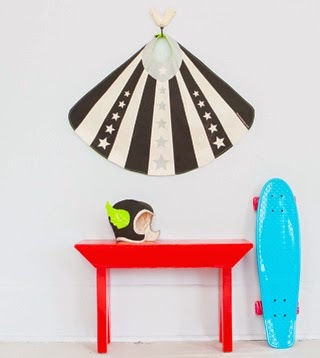 Her gorgeous designs appeal to kids but the don't offend adults sensibilities. On top of that, they are incredibly well made and are the kind of thing that you're grandchildren are going to enjoy too - I know, think of that!! It's an heirloom piece folks, you can't not buy one!! Our cape arrived on Friday and I'm captivated by it. It pains me to have to hide it in my wardrobe for the next 24 days. I might just have to get it out from time to time and spin around in it myself. I hope Felix loves it. I'm pretty sure his brother is going to pinch it! Lovelane don't just make capes. 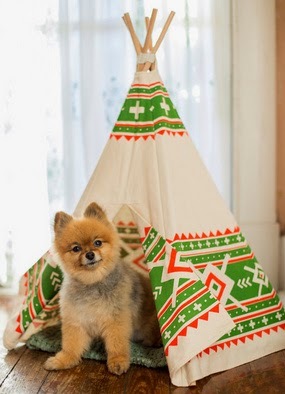 There are amazing hats and cuffs that match and even (hilariously but I love it) pet teepees!! I love a clean tidy house. Most people know that about me. It's no secret. I've written about it here before. On top of liking a clean house, we live in a hard water area. 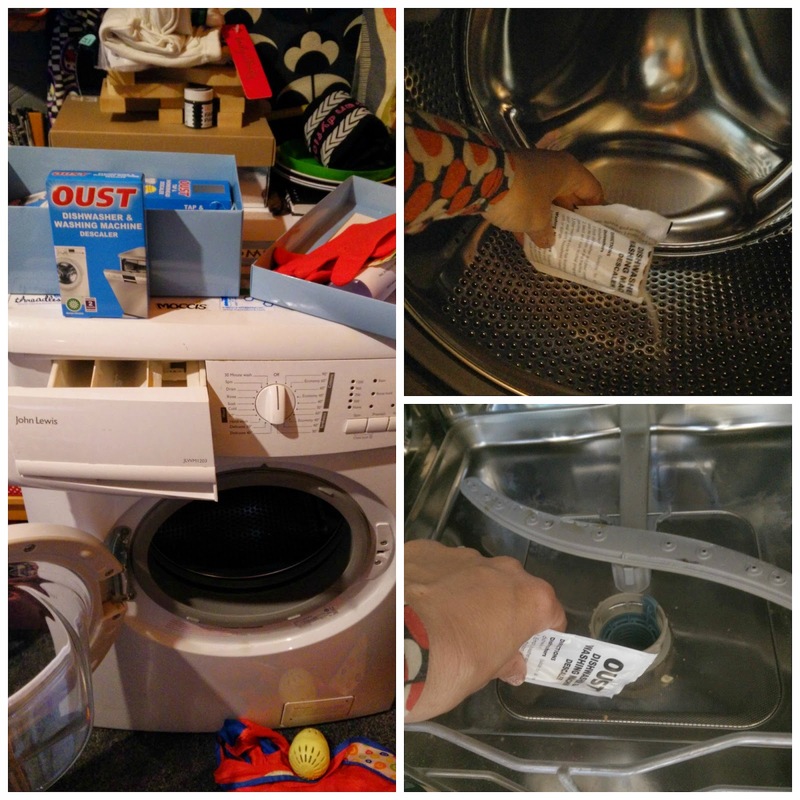 Anyone living in a hard water area knows that means one thing - limescale! Anything in our house that has regular contact with water has a limescale issue. Taps, the loo, the kettle. Even toys the boys play with in the bath and the draining rack in the kitchen. Limescale, the cheeky thing, builds up on everything. So, when a huge bundle of Oust products arrived in the mail I was very happy. Something that would come in very handy and be satisfying to use! I have to descale our kettle very often, I would say every 2-4 weeks. Most often I use white vinegar to do the job because it works and it reduces the amount of chemicals being used. However, I do have to use something a bit stronger from time to time because the vinegar, whilst it does work, doesn't seem to do quite as good a job. Personally, I've always used Oust for the kettle. In the package we received there was a kettle descaler sachet included except it was a little different to the one I'd used before. Usually I use one which is in a plastic sachet you have to cut open and poor in. Oust have got a bit clever here though and come up with a nifty little bag that can be placed straight into your kettle and disposed of afterwards. Very handy and means it's less likely you'll come into contact or get chemicals on your hands. I found it worked very well. I just followed the instructions on the box (fill your kettle half full, boil, place in the sachet and leave for a while). You just have to look at the pictures to see it did the job! Oust also sent me some other limescale removing products including one for dishwashers and washing machines. I've never used anything on either of those before so I was happy to give them a go. 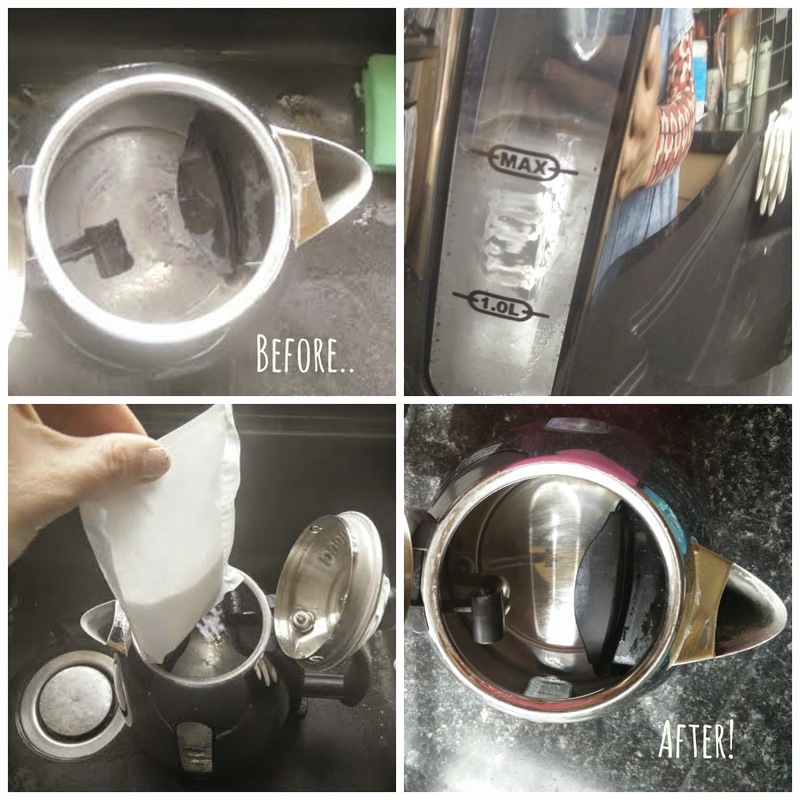 I have to say that using limescale removed on the dishwasher and washing machine doesn't really give you results you can see but knowing how well it works on my kettle and knowing how hard the water is where we live I can be sure that it's been beneficial to use! All of the Oust products are easy to use with clear instructions. I'm not just saying that, look at my gleaming kettle! 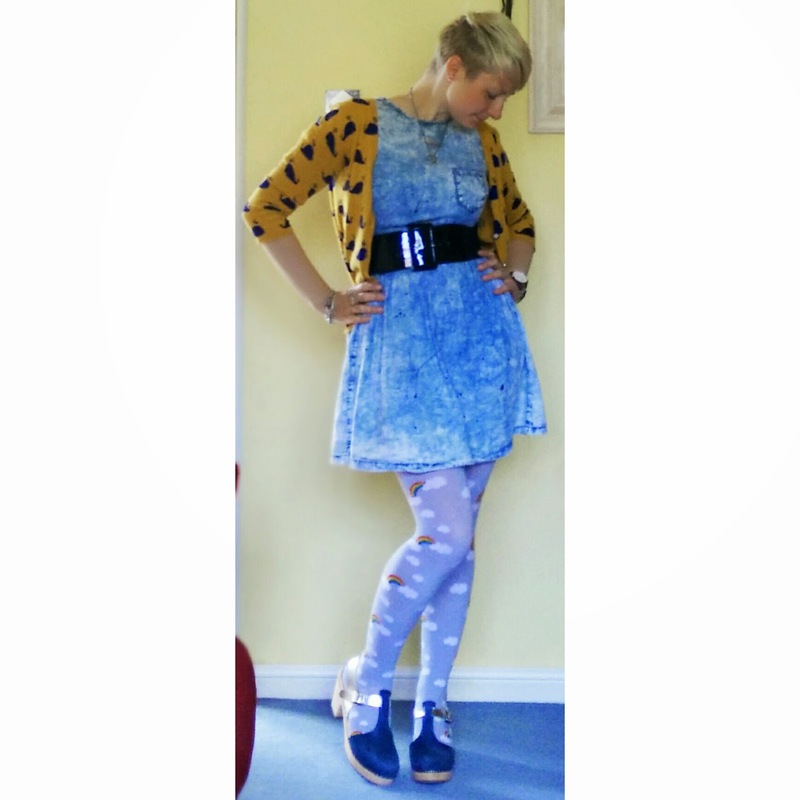 I am quite a crafty person naturally, I love to create, I love colours, I love texture. I just don't find much time to do it now I'm a Mum. I know some parents are always up to something crafty but I'm usually too busy blogging, researching fashions, reading, faffing about online, selling stuff on eBay, trying to catch up with hubby, All the usual stuff. Craft doesn't always get a look in! Lovely bloggers network Joe Blogs contacted me a while back and asked if I'd like to attend their craft event at @Bristol in Bristol (duh!). I leapt at the chance. It's not that often there are blogging events that close to me. Plus, a chance to craft without the kids crawling over me for a couple of hours- yes please! The day itself actually worked out well for us as a family (something I do worry about with blogging events is them taking family time up) as we have @Bristol family membership so whilst I was getting my craft on, Pete took the boys around the delights @Bristol has to offer (we love it there and I have to say it's very worthwhile getting membership but that's a post for another day!). The craft event itself was actually hosted with The Crafty Hen (who run craft workshops) and Laura Ashley. I'm not all that knowledgeable about Laura Ashley so I was excited to see what their fabrics would be like! I wasn't entirely sure about what we would be crafting but when we arrived we were told that we would be making a cover for a notebook and some Suffolk Puffs. I didn't have a clue what on earth a Suffolk Puff would be (let's not make any crude jokes here!) so I just thought I'd focus on the notebook. Covering a notebook is, in theory, relatively simple. But double sided sticky tape is a beehatch to work with, excuse my French. It took me a lot longer to get the job done. It's probably made harder by the fact I'm a bit of a perfectionist and I wanted my finished cover to look good! There were some beautiful fabrics to choose from (all from Laura Ashley's current collection) and some cute accessories like buttons and ribbons. We had access to needles, thread and a glue gun. We received a demo from the ladies of The Crafty Hen (who were great, very patient and helpful!) and had a handout with simple instructions on. In the end I quite liked my cover! After a little lunch break (a chance to catch up with lovelies like Ella, Kath, Lucy and others we got back to the crafting. Now it was time for me to find out what on earth a Suffolk Puff would be! The answer is that they are circles of material on which you sew a running stitch around the edge - this is then pulled to create a scrunched up "puff" shape. Once you have created your puff you can use it in as many ways as you can think of. A rosette, a hair piece, a broach. Decorated with ribbons, buttons and net. I found myself really falling for these puffs because they are so simple and yet so effective. I can think of so many ways I could use them and I think that they'd make lovely presents. I ended up making three in different sizes and then creating a facinator which actually, I'm damn proud of! It was a great afternoon. Thanks to all involved! My crafty juices have started flowing again! Twinning. It's a bit of a controversial subject I'd think. 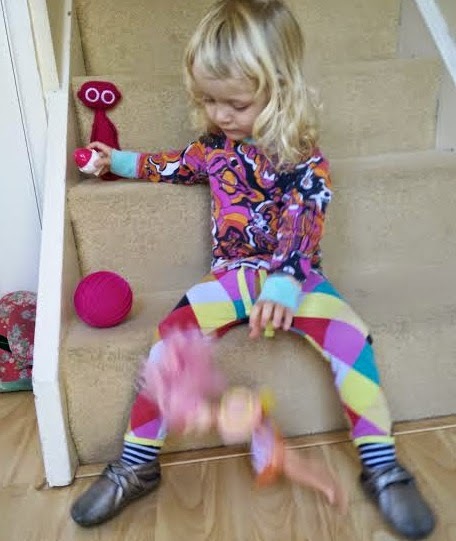 After all, I know people who find the idea of dressing their kids in similar or matching outfits abhorrent (there was a time when I wasn't keen on it myself!). Do you know what I mean by twinning? It's all over Instga these days darling! 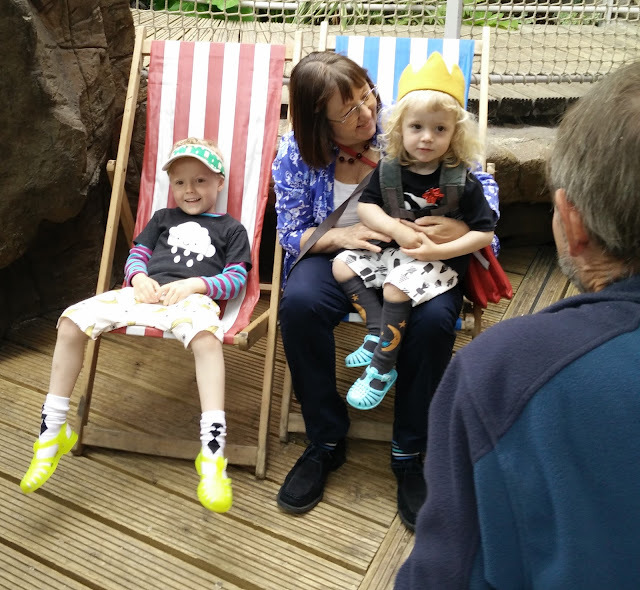 Getting all matchy matchy with the sprogs in your life. When I just had Ethan I would sometimes see some families where the children were matching each other and I'd think it a bit tacky.. but like a lot of things in parenting (and life) when your situation changes you suddenly find yourself changing your mind. You're pregnant with baby no2 and suddenly those Big Brother Little Brother tees don't look so bad.. no, they look cute! You have two children and suddenly it becomes thrilling when you find shoes that match in their exact (different) sizes. And then.. you walk around the corner in TKMaxx and... what's this? THEY HAVE THE SAME SHOES IN MY SIZE TOOO!! What if I... no... I couldn't, could I? BUT IT'D BE SOOOOO CUTE!!! See? It creeps up on you! Somehow I find it amusing if we go on a family outing and all 4 of us are rocking our chucks. They might not all the the exact same colour, but we all have a pair of converse, Pete included! Then there's the DMs. Both my boys have a pair of black patent DMs and I have a pair of mat black ones. I love it if we're all wearing them! You can go a step further too! 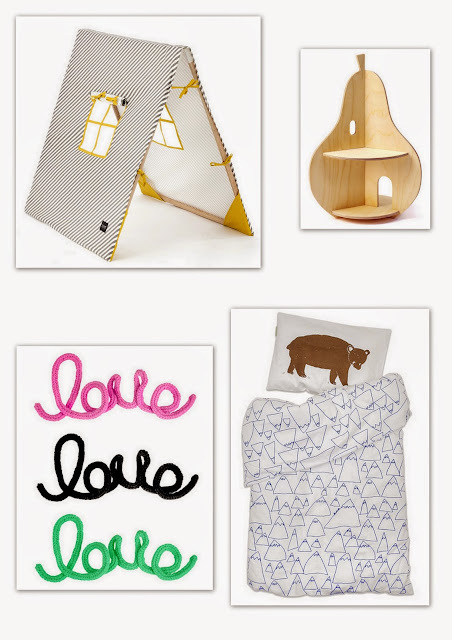 Lots of the independent brands I find on Insta these days have some of their stock sized for kids and adults. 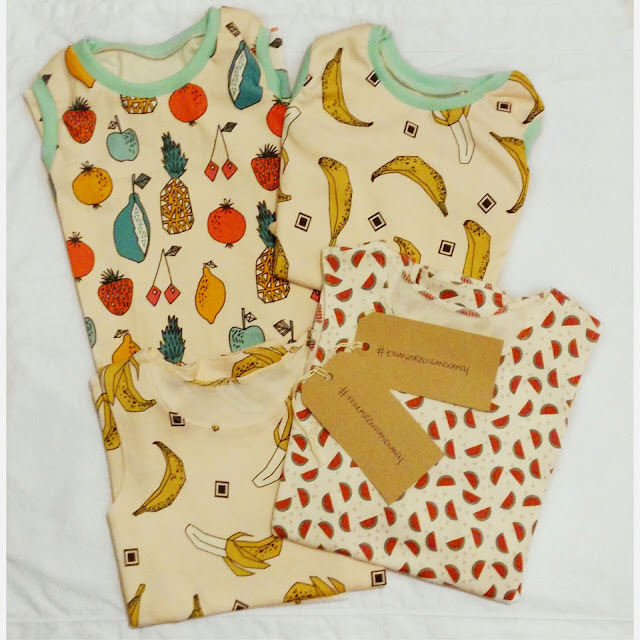 You can get matching items from Hello Apparel (stocked at Southwood Stores in the UK) and Whistle and Flute. 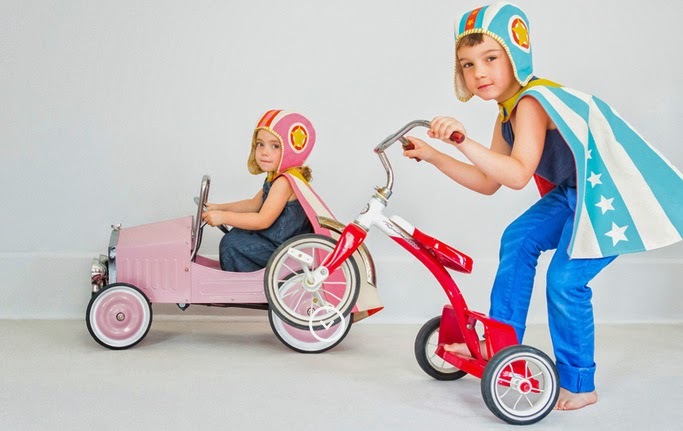 One of my fave online shops, The Dandy Kid, have recently got some exclusive stock - they have snagged Scandinavian inspired Canadian brand The Wild kids apparel. I am excited about this because they have designs in adult sizes as well as kids! Their designs are simple, modern, quirky and appeal to children and adults alike. Personally I love the owl and lumberjack designs. I'm really hoping that The Dandy Kid start to stock some of their other designs too!! What are your thoughts on twinning? Do you do it? Would you do it? If you've written a kids fashion piece lately, please do link up below! Tweet me your link and I'll retweet.